(Sutton Hart Press) offers a blueprint for business leaders and their counsel to proactively protect their companies against class actions and other mass actions by creating what author and attorney Robert Herrington calls "firewall defenses." Among the proactive strategies offered in his book is introducing "strategic variability" into company advertising, disclosures and other consumer touch points to reduce the odds of class certification when a claim is made. Strategic Variability is a risk management tool premised on the foundations of class-action and mass-action law. Variability is a class action killer. If customers did not experience essentially the same problem in dealing with your company, the class-action device cannot be used. It is as simple as that. One relatively simple class action antidote is to keep track of material differences. When defending a class-action lawsuit, one of the keys to winning is being able to show that there is no one set of facts the plaintiff can prove to prevail in the case. You want to show that there is significant variability, differences in each consumer's experience that prevent the case from proceeding as a class action. If the court agrees and refuses to certify the class, the case often is over, as there is little incentive for the plaintiffs' attorneys to proceed (other than to try to exert leverage through an appeal). At a minimum, the plaintiffs' position is crippled, often leading to an extremely favorable settlement in which the defendant can erase potential liability for pennies on the dollar. You want to show that there is significant variability, differences in each consumer's experience that prevent the case from proceeding as a class action. Given the importance of being able to show variability, I am consistently surprised how often companies are not able to provide this type of information. And not because it doesn't exist. You explain how important it is to show variability and ask the client about differences in disclosures or products or advertising, then you begin to run out of ink before getting it all down. You ask the company to send you all the different versions of the products, or disclosures or ads - and you get silence. You ask if they're still there and they say, "Well, that would be really hard and really expensive to pull together," or "you know, I'm not sure how far back that stuff goes," or "I don't know if we can tell for sure when different versions were in use." Sometimes you can piece the record together, but only after a lot of work and even more expense. Many times they cannot, and the risk of facing a certified class action skyrockets. One step in implementing a Liability Firewall Process at a company is establishing a procedure to keep track of material differences at each point of consumer contact. For each area of consumer interaction, institute a procedure where changes are tracked and maintained: changes in advertising, disclosures, website, warnings, warranties, instructions, and consumer contracts, effectively anything your consumers see or receive. There are high-tech ways to do this, but all you really need is a file with each version and a notation regarding the dates it was used. You can organize it by product line or business segment or however makes sense for your company. If and when a lawsuit is filed, you will be able to immediately provide the evidence of variability that can help defeat class certification. This simple process can be an invaluable tool for reducing the amount your company must spend defending class-action litigation. One specific area of focus should be consumer contracts. Every company has them. Whether you sell to another business, to retailers or directly to consumers, you are entering into an agreement with someone to purchase your product or service. Those contracts are a key tool to limit your company's risk of class actions, but they also can be dangerous. Many companies, with good reason, attempt to standardize their contracts across products and business units. This standardization however, creates a risk; the risk of a class action. If your contracts are all the same, then a problem or error in the contract can create the same type of liability for everyone. You see countless cases where a court certifies a class action based on some problem in the terms of a standardized consumer contract. The message is to spend the time to truly think through the provisions of your company's consumer contracts. Every one of your customers is going to receive this document, so it needs to be bulletproof for your company and its business. To make it bulletproof, you need to put in the time and resources to ensure the agreement is complete, accurate, easy to understand, and furthers your company's liability reduction goals. Do this regularly as a way to implement Strategic Variability, thereby reducing the risk of consumer class-action lawsuits. What do I mean by Strategic Variability in this context? Remember, class actions thrive on similarity. They demand that everyone be in essentially the same position. If you can make changes that introduce significant variability, you can limit your risk of class actions. So look for ways to modify the material terms of the contract at least one time each year. Focus on how you disclose and describe the contract obligations your consumers are most likely to complain about: price, renewal terms, warranties, guarantees, availability of upgrades, use of personal information, customer support, return and refund limitations. Change the wording. Move paragraphs around. There is almost never just one way to say something. So look for ways to mix it up a little. If you do this correctly, you can limit class action liability for issues relating to that contract to a year or however often you decide to make material changes. A behind the scenes look at class action litigation where plaintiffs' lawyers thrive on Jackpot Justice while companies face unnecessary economic peril. 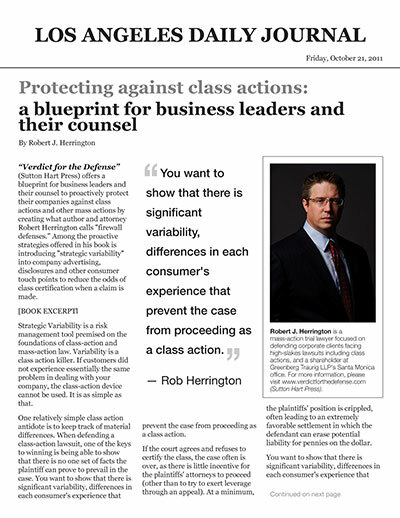 A guide for business leaders to fight back from defense attorney Rob Herrington. Something is askew in the legal system when some plaintiffs' class action firms make more than many Fortune 500 companies. Rob's groundbreaking work exposes a new generation of threats facing U.S. business leaders.